Watch Monday, December 22, 2014 at 8pm on WMHT TV. The “Baby Boom” of the mid-20th century created a generation of people who grew up witnessing the rise of television, space exploration, and rock ‘n’ roll. 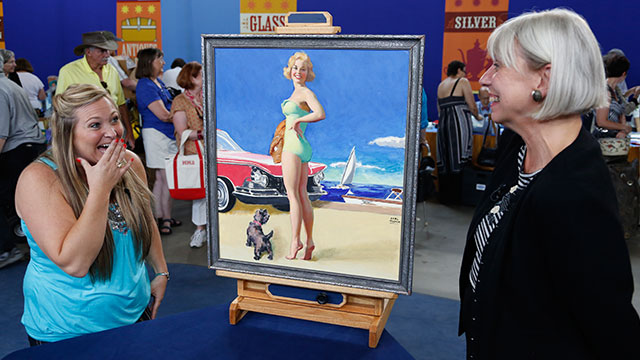 In celebration of the “Boomer Years,” ANTIQUES ROADSHOW is looking back with nostalgia at the vintage treasures from the 1940s, 50s and 60s, including a 1956 Elvis “Love Me Tender” standee that was found during a home renovation; a 1958 Martin Luther King, Jr. letter purchased for $20 at the estate of a Richard Nixon biographer; and Charles Schulz comic strip art, ca. 1960, owned by a former Hallmark employee who worked with Schulz for 12 years and is valued at $200,000 to $250,000.